Name two specific conditions that are produced in tissue when it is placed in a strong magnetic field that contribute to the imaging process. Describe the characteristic that a nucleus must have in order to interact with a magnetic field.  Explain the concept of a magnetic moment. Describe the basic motion of a nucleus that produces it's magnetic moment. Name and briefly describe the three factors that determine the RF signal strength from a voxel of tissue during the imaging process. Explain the general relationship between an isotope's mass number and it's magnetic condition. 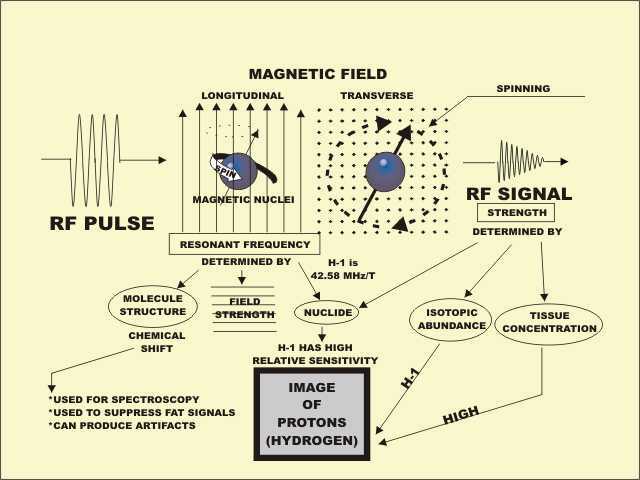 Explain why hydrogen is the only chemical element that is imaged with conventional MRI. Explain why we do not image the elements oxygen and carbon, even though they have high concentrations in tissue. Explain why it is not practical to image elements such as sodium and potassium, even though they are present in isotopic forms with magnetic nuclei. Explain the concept of isotopic abundance of a chemical element and how it affects the ability to image that element with MRI. Describe three characteristics of hydrogen that make it practical to image with MRI. Identify and briefly explain the characteristic used to describe and distinguish the various RF pulses used in MRI. Explain how the general orientation of magnetic nuclei change when tissue containing the nuclei is placed in a strong magnetic field. Describe the concept of precession in when it occurs with magnetic nuclei. Explain the concept of resonance as it applies to nuclear magnetic resonance. Explain what happens to the motion of a magnetic nucleus when it is flipped from the longitudinal to transverse direction. Describe the basic interaction that causes a magnetic nucleus to be placed in an excited state. Explain the general concept of relaxation, as it applies to a magnetic nucleus. Name and briefly describe the three factors that determine the resonant frequency of tissue in the MRI process. State the resonant frequency of hydrogen-1 in a 1T magnetic field. Describe the relationship between resonant frequency of tissue and the strength of the magnetic field where the tissue is located. Explain the concept of chemical shift in resonant frequency. Identify a potential problem that the chemical shift effect can cause in MRI. Briefly explain where the chemical shift effect can be used to an advantage in MRI.